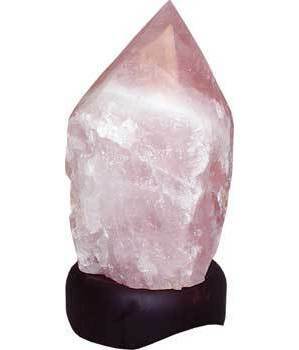 Crafted from a solid piece of Rose Quartz with a natural point that has been polished smooth while the sides remain faceted, this lamp is a lovely addition to any space. Fastened to a wooden base with three curved legs for ease of cord placement this lamp comes complete with socket, cord, and bulb. This is a natural crystal with size and color variations, base included approximately 4 and 1/2 inches to 5 and 1/2 inches in height.